"As I say to my co-volunteers, you are the change that you dream, as I am the change that I dream. And collectively, we are the change that this world needs to be. Mabuhay!" 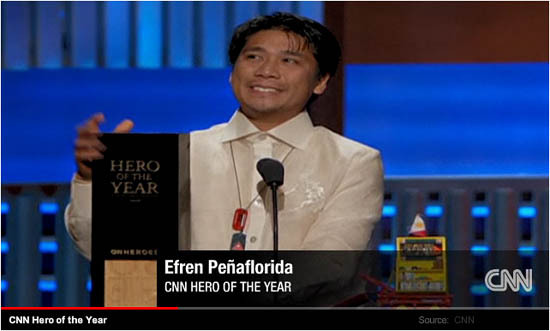 Efren Peñaflorida ended his speech with these inspiring words after he was hailed the 2009 CNN Hero of the Year at an All-Star tribute at the Kodak Theatre in Hollywood on Saturday Night. Congratulations! Mabuhay ka Efren! We are so proud of you! Efren Peñaflorida, who will receive $100,000 to continue his work with the Dynamic Teen Company, was selected after seven weeks of online voting at CNN.com. More than 2.75 million votes were cast. Read full story: Pushcart educator named CNN Hero of the Year.